It has been over 100 years since the Battle of Waterloo - but on Friday the 8th of June - a different kind of battle took place at the station bearing the battle's name. Members of the Wilkinson Sword sponsored British Olympic fencing team took their places on the Piste at a unique fencing themed takeover at Waterloo Station. They were there to showcase their skills and build excitement for the upcoming competition in the 2016 Rio Olympics. Founded in 1772, Wilkinson Sword was originally a sword manufacturer, who eventually went on to become one of the UK's foremost razor brand. It was only a matter of time before a partnership was forged between Wilkinson Sword and British fencing. There were a number of exciting interactive experiences for passers-by to engage with at Waterloo Station. One of the major crowd pullers was a fully functional fencing piste that set the stage for professional fencers donning head to toe gear. World class Olympians duelled throughout the day whilst commuters watched on, the stress of missing of trains trumped by the heart pumping clashes. The display even had Police officers stopping by for some tips on how to effectively protect the public through sword combat. To one side of the piste was a skill testing machine that challenged the reflexes of those who were up to the task. Young and old piled through to hold a fencing sabre up to a touch sensitive board displaying five targets. Each time one of the targets would light up, challengers had to hit it with the sabre. The average reaction time of each hit was calculated and a time was given. The most impressive score came from an 8 yr old future knight who pulled together an impressive score of 0.60 of a second. Rumor has it that British Fencing have put him on the team for Rio. Another experience that had commuters queueing, was the green screen station put together by brand experience agency #HASHTAG. People were jumping at the opportunity to get dressy in samurai and knight costumes. 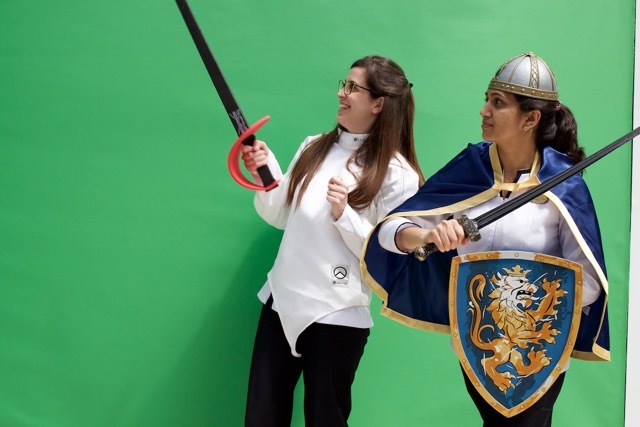 They then had their photos taken in front of a green screen which superimposed their image onto one of four sword themed backgrounds. They could then share their photos with the hashtag #READYTODUEL directly from a kiosk for a chance to win a year supply of razors. The background choices were between a knight, dragon, samurai and recent fencing world cup winner James Davis. After background choices being mixed at the start, by midway through the afternoon it became clear that people were only interested in fighting dragons. Game of Thrones has clearly become an ingrained part of our culture now and not even a top ranked Olympic athlete can compete with a mythical fire-breathing beast. The event was a massive success and thanks to Wilkinson Sword and British Fencing, we're even more excited to watch our team on the Rio world stage in August. A big thank you to creative agency Slice for helping put together a wonderful event that saw many happy faces walking throughout Waterloo train station. Now let's get some medals!